I have a 7750 and it is barely noticeable noise wise but you do feel the weight sometimes as the rotor shifts, I like it, some don't. As James says it is all about personal preference. Personally I like the idea of an automatic I can hear as it just does its thing. Not experienced this movement before so I look forward to getting one. Thank’s, that clears thing up, no change in size then. I could see something wasn’t quit right, case width or lug width had to be wrong. I wasn’t sure about the lug length as they looked proportionately longer than the old watch. I can now see this is because the lug ends are straight on the new renderings but curved/slanted on the old watch. Interestingly the original drawings also show straight lug ends. Looks like lug width will be unchanged at 22mm. 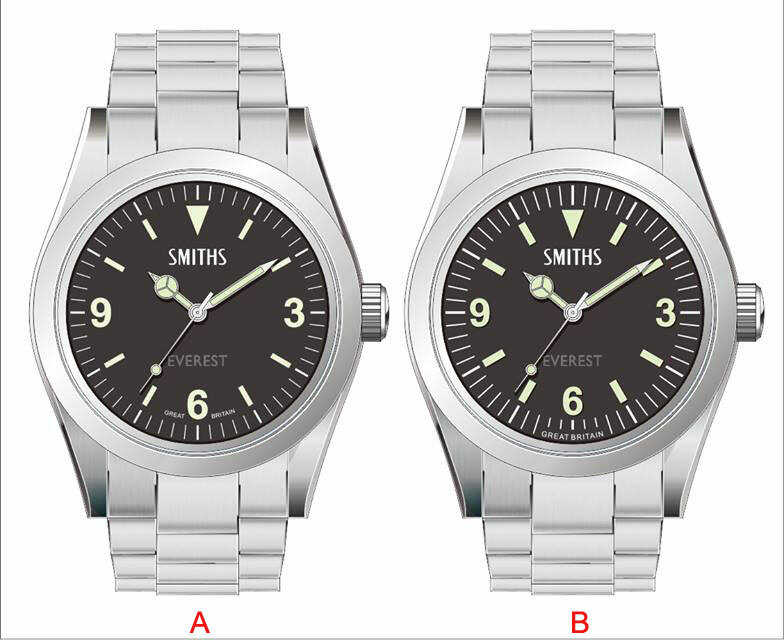 Having just bought a Seafire, which is an excellent watch and caught the "Eddie" bug, I am quite certain I might get one of these. However, I too would have preferred a smaller watch, about 38mm. Don’t be a sissy .... ETA’s Valjoux 7750 is even noisier and used by all sorts of high end brands. 9015=reliable and needs little maintenance. It probably varies from watch to watch, but neither of the 7750 watches I own at the moment make any noticeable sound from the movement. The Everest was by far the noisiest rotor I've had, although I found it part of the watch's character, rather than particularly annoying. Release date for revamped version? Sorry if I've missed it somewhere. Anybody know a proposed release date for this? The urge to buy one of Eddie's creations is becoming irresistible. I'm currently torn between three very different models - the soon to be released PRS-18Q, the PRS-29B and the latest Everest. The only thing they have in coming is no date window ! "have in common" that was meant to be ! Don't get a PRS29b....i did and now i want the Everest! I have one of Eddies Speedbird 1903 Chrono's it has a Valjoux 7750 and I love the movement and noise of the rotor doing its thing. Normally when I take it off and put it on the table you can hear it spinning like its alive. 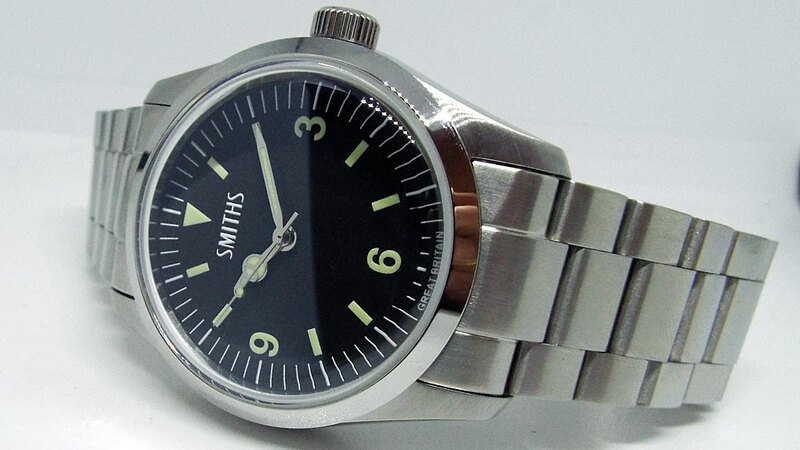 Could someone explain this whole Time Factors thing - would love to get a Smiths Everest but can't see them for sale anywhere on the net, and not on the Time Factors page on here? Is TF somehow linked to TZ? Thanks in advance. If you read this very thread, their current and future availability will become clear to you. I wonder if the use of Sapphire will reduce the rotor noise from the 9015 or make little difference? I found mine quite noisy, not that it was a real problem mind. Why fight it? Get both. This thread is pure evil. 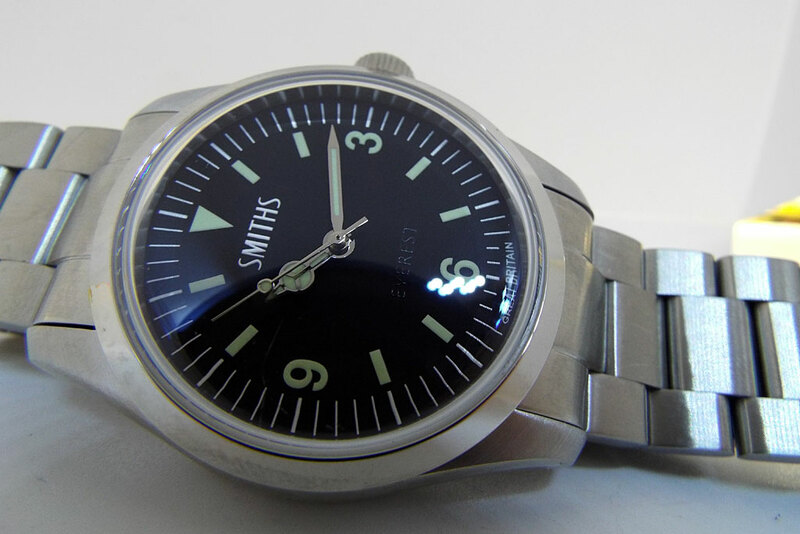 I had a Smiths Everest and couldn't get on with the bracelet and the central links just made the watch case feel too long for my liking, so it went. Then reading this thread made me want another of the old ones with acrylic crystal before they all disappear and the new sapphire crystal model comes out. Anyway, managed to snag one and put it straight on a Brady Sailcloth Strap and the result is superb, looks and feels a completely different watch. The bracelet can just stay in the wardrobe. Last edited by Wallasey Runner; 20th March 2018 at 21:27. The bracelet was the reason I sold mine about 4 years ago. Reading through this has made me want to try again on a Hirsch! I had a TSS Titan brown leather waiting for mine when it arrived in December 2011, the bracelet came straight off and has been in the case with stickers on ever since. I wore mine on a Hirsch Liberty, although I never wore it on the Bracelet it did look well made. At the time I tired mine on a Darleena I think. It was quite thick and bulky, well for my taste anyway. 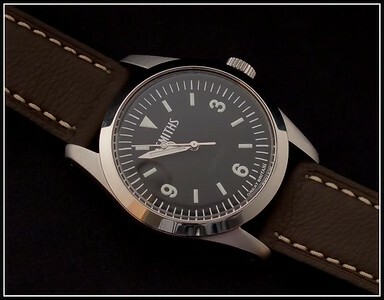 I think a thinner strap such as my now favourite, Hirsch Duke might work well. The bracelet is indeed well made, with the lugs being 22mm though it was just too heavy for the watches style for me. 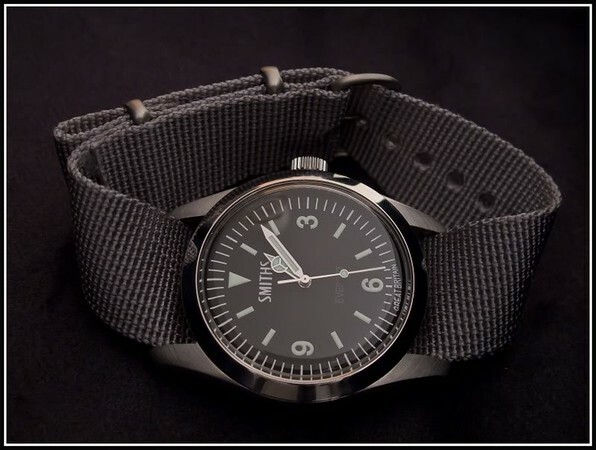 I see a lot of Everests on straps that are too thick/heavy for the size of the watch head (this happens with many watches). The archetypal error (to me) is to stick a Toshi on a watch. This is where the Titan works for me, just the right dimensions for this watch. Last edited by wildheart; 21st March 2018 at 09:53. I've worn my Everest a lot, and I've been through a fair few straps on other watches over the years, and the Titan is the hardest wearing strap I've ever had. The rotor noise from the 9015 within the Gruppo Gamma Vanguard T16 is equivalent to the rotor noise from the PRS25 even with its Sapphire IMHO. But as you say not a real problem. I was in the "bracelet is too bulky" camp for a long time and wore my Everest on leather. Then I wanted the strap for something else and somehow the bracelet seems perfect. I'd love to see some bracelet wrist shots. The PRS-18Q is exciting, but I'm holding out for this new Everest. Very excited about this, whenever it makes an appearance. The original 25 is one of the very few watches I regret flipping over the years. Put me down for one ! ^^^ Now they are always some lovely curves! Wow, the crystal looks amazing! Wish the size could drop to 39mm. Keep waiting for the email notice that these are available. Looks great. mine made a noise like an overloaded £200 washing machine on spin cycle. still a lovely watch though. Prototype unpacked 5 minutes ago. A couple of quick & dirty. Hmm not bad at all. Great news and preliminary pictures. Can't wait to see more and details of when these are going to be available. Looking good from what I can see. I'm really looking forward to this watch but why do the minute markers have to be so LOOOOOONG? Wasn't that one of the major criticisms of the first version? Version A looks great;with a hand set that actually touches the the minute track(minutes and seconds)it would be perfection. Agreed. Style A but with seconds hand to the minute markers. With that said I know nothing about watch design or costs involved with this etc etc. Last edited by canuck; 8th June 2018 at 16:11. Yes, I think so too. Minute hand needs to be longer. Dial A.
I've always liked the Everest but agree that the second markers are a bit on the long side. I also prefer the GB text below the second markers. I also like the 3/6/9 text in Explorer 1016 dial. 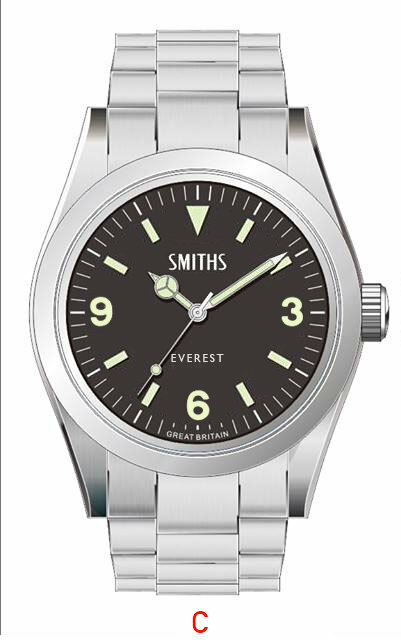 This has a slightly lower Smith logo and smaller Everest text. Apologies if this muddies the water. This dial looks really good as well,but again the minute and second hand longer and touching the minute track would be perfection;like on a 39mm Explorer 1 214270 or a 39mm Railmaster 2503.52. Last edited by silver centurian; 9th June 2018 at 22:57. I agree, the slightly lower position of the “Smiths” logo does look better. It makes the higher position look a little cramped.